Let's be honest: Seeing a number at the end of the day can make getting more walking in a lot more fun (talk about instant gratification). Not bad for an investment of around $15. Striving to reach a goal, such as 10,000 steps at day's end, can be just the motivation you need to keep moving. University researchers looked at the results of 26 studies involving the use of pedometers in adults. They found that the study results showed that people who used pedometers significantly increased their physical activity -- and took more than 2,000 steps per day more than study participants who didn't use pedometer. Further, the researchers noted two physical benefits as a result of wearing a pedometer -- a decrease in the volunteers' BMIs ( body mass index) and their systolic blood pressure. After just two weeks of walking more, you might see some measurable health benefits, too. Walking even 30 minutes every day for two weeks should be enough for people with hypertension to see better blood pressure, and people with diabetes or elevated blood sugar to see better blood sugar levels, says Karen Collins, MS, RD, CDN, nutrition advisor to the American Institute for Cancer Research. With each sip of green or black tea, you get health-promoting substances: two potent flavonoids -- anthocyanin and proanthocyanidin -- and a healthy dose of catechin. Green tea in particular is loaded with the catechin called EGCG (epigallocatechin gallate), which is suspected of having some anticancer properties. Try buying some flavored green (and black) tea bags, and keep some at work and at home near your hot water kettle. Figure out when you're most likely to want some tea, be it midmorning, afternoon, or before bed. Then you can get yourself into the habit of making yourself a cup of tea at that particular time of day. If you're sensitive to caffeine, choose decaf teas. This habit can be particularly healthful if tea takes the place of other beverages that contribute calories without any beneficial nutrients. Switching to 100% whole-wheat or whole-grain bread is easy, especially now that so many 100% whole-wheat products are available in supermarkets -- from hot dog buns to breakfast cereals to pasta. Whole grains are naturally low-fat and cholesterol free; contain 10% to 15% protein; and offer loads of fiber, minerals, vitamins, antioxidants, phytochemicals, and more. Whole grains can help to protect you against cardiovascular disease, stroke, diabetes, insulin resistance, obesity, and some cancers. And you may see a difference quickly, some experts say. "Two weeks should be enough time to see a benefit with a higher-fiber diet in terms of constipation [as long as fluid consumption is adequate]," says Collins. She says this may also be enough time for people with diabetes or insulin resistance to see improved blood sugars. The trick to switching to whole grains is to keep trying products and brands until you find one that works for you and your family. Once you find brands of whole-grain hamburger buns, sandwich bread, hot and cold breakfast cereals, crackers, and pasta you like, sticking to this resolution will be a snap! When cooking, it's best to replace butter, margarine, or shortening with an oil that has more of the "better" fats and less of the "worst" fats -- like saturated fat -- whenever possible. If a recipe calls for adding melted butter, shortening, or margarine, that's your cue that you can probably switch to canola oil without any change in texture. Canola oil contributes two "smart" fats -- monounsaturated fat and plant omega-3s. It also has a neutral flavor that doesn't compete with other flavors, and is reasonably priced and widely available. Olive oil is also high in desirable monounsaturated fat and low in saturated fat. Further, it contains more than 30 phytochemicals from olives -- many of which have antioxidants and prompt anti-inflammatory action in the body. Just remember to drizzle, not drench, your food in oil because even healthy oils add more than 100 calories per tablespoon. Katz also suggests switching from margarine or butter to a spread with added plant sterols, like Benecol or Take Control. "They are designed to help lower cholesterol and could do so within weeks," he says. Too much sodium (aka salt) is a problem for lots of Americans, especially those with high blood pressure. And the key to cutting back, says Collins, is to eat fewer processed foods. "People need to realize this is largely meaning a change in processed food use," says Collins. "Just using the salt shaker less won't touch the source of excess sodium for most Americans." Eating fewer processed foods could also make room in your diet for more fruits and vegetables, which increase potassium -- a mineral that has been linked to lowering blood pressure. According to Collins, people with salt-sensitive high blood pressure who cut down on sodium may see a drop in blood pressure within two weeks. Some people with hypertension are not salt-sensitive, however, so they may not see results so quickly (though cutting sodium will benefit them in the long run). Read the labels on processed and package foods. When you have a choice at the supermarket, buy lower-sodium choices in soups, crackers, salad dressings, canned tomatoes, and other products. Learning how to exercise is only part of the problem when it comes to attaining your physical goals. Learning how to eat healthy is an equally important goal. However not everyone is raised knowing how to cook. Sure, your mother probably taught you how to bake cookies... but those aren't exactly healthy. When it comes to cooking a lot of your options aren't very healthy either. You have to learn how to make healthy choices and healthier recipes. You could just buy a recipe book with lots of healthy recipes in it... and then forget to read it. Many people do that. It takes effort to go out and buy all the necessary ingredients and even more effort to experiment with new recipes. The easiest way to learn is to have a friend teach you. eg. My friend Lyn from beautiful-vegan.com taught me everything I know about Vegan cooking. However lets pretend your friends are either busy, not that good at cooking healthy, or lack the necessary teaching skills. So what are your remaining options? Well you could take cooking classes, but often such classes are geared towards a specific topic such as Italian cooking lessons in Toronto. However you could get private cooking lessons in on a topic of your choice. My recommendation would be Luca from LucaToronto.com, because his prices are exceptionally fair and you can choose the menu from a range of healthy options. He does specialize in Italian cooking, but if you check out the variety of recipes on his website you will see quite a few healthy vegetarian based recipes. Want more? Consider hiring Luca for his private cooking lessons in Toronto. 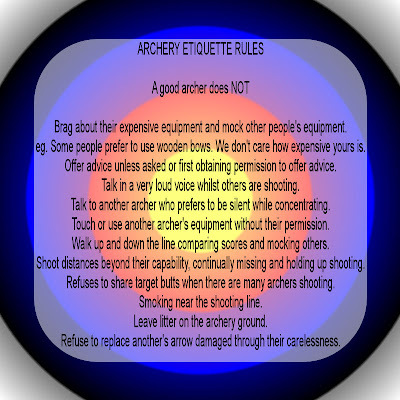 I recently came across several different sets of rules for Archery Etiquette. 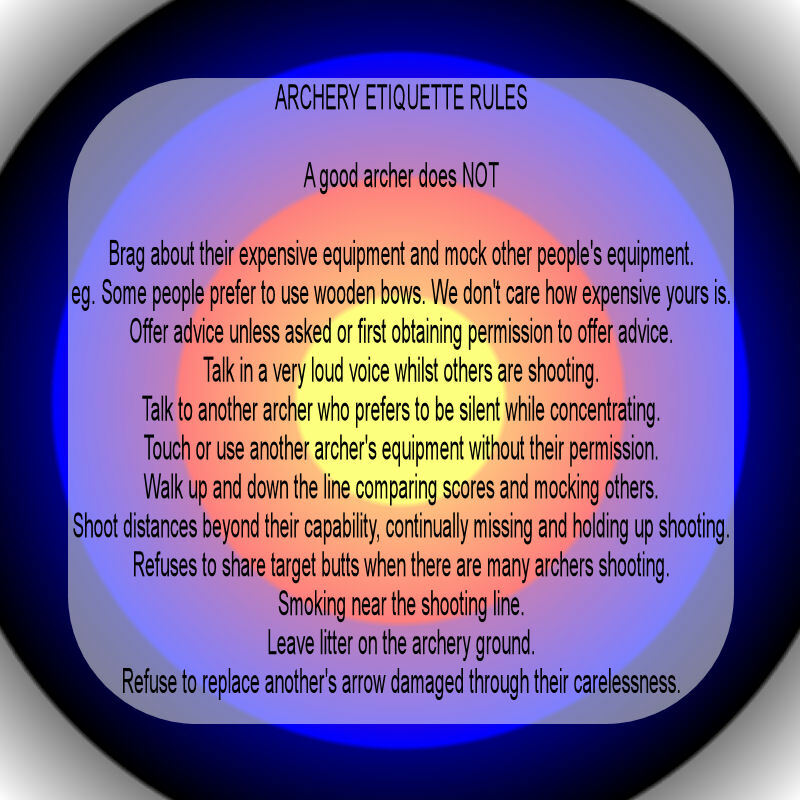 Most archery ranges have these rules (or similar rules) posted up somewhere at the range. If they don't then its really up for people to teach newcomers to the support what things are expected and what things are considered rude. For most archers this isn't a problem. 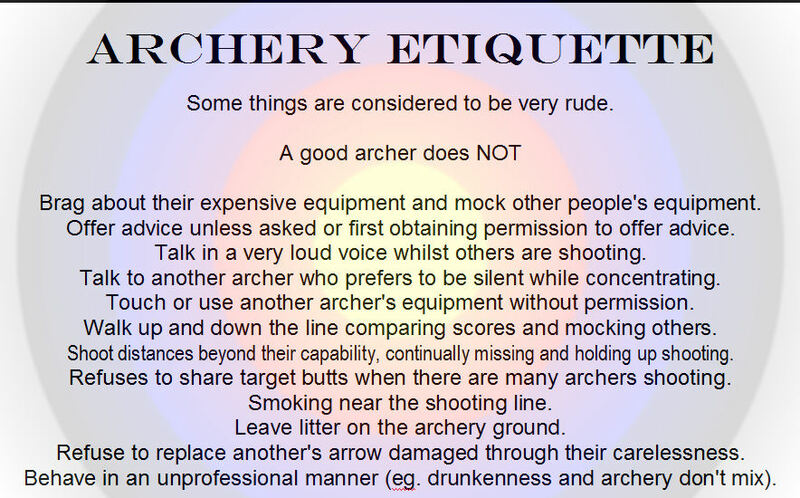 Most archers are extremely polite and would never think to touch another person's equipment or even mock the equipment of others. 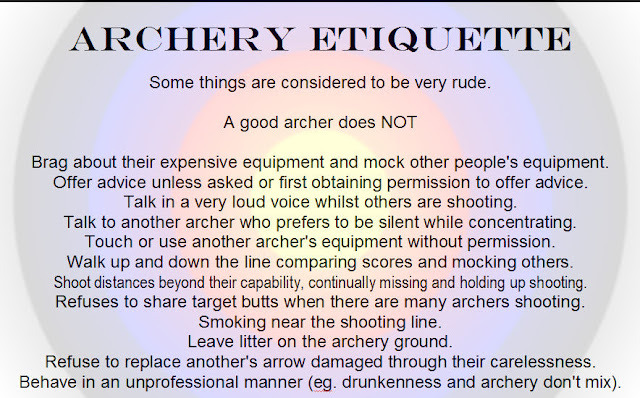 But since all the recent films (Avatar, The Hunger Games, Brave, The Avengers, etc) there are a lot of new people at archery ranges across North America and they don't know that a certain level of politeness is expected. Brag about their expensive equipment and mock other people's equipment. Offer advice unless asked or first obtaining permission to offer advice. Talk in a very loud voice whilst others are shooting. Talk to another archer who prefers to be silent while concentrating. Touch or use another archer's equipment without permission. Walk up and down the line comparing scores and mocking others. Shoot distances beyond their capability, continually missing and holding up shooting. Refuses to share target butts when there are many archers shooting. Smoking near the shooting line. Leave litter on the archery ground. Refuse to replace another's arrow damaged through their carelessness. Behave in an unprofessional manner (eg. drunkenness and archery don't mix). Doing weightlifting in the morning for 10 minutes every day is a great way to build muscle and add to your daily routine. For best results, exercise right before eating a breakfast with a fair bit of protein in it. eg. Eggs or Pancakes. #1. Focus on lots of repetitions. If you can't do 10+ of the same weightlifting exercise then you are picking something too difficult. Ideally you want to be doing something 30 to 50 times. #2. Use a variety of different exercises which emphasize different muscles. Don't just focus on your biceps. Target your forearms, triceps, core muscles, leg muscles, triceps, pectorals, obliques and more. If you only focus on one set of muscles you will see very little results. A full body approach garners better results. #3. Hydrate! Drink lots of water, or better yet, drink juice while exercising. #4. Listen to music to help you build a rhythm and motivate yourself while weightlifting. #5. A small whey protein drink with your breakfast after you've exercised won't hurt. Plus a multivitamin is also a wise choice. #6. Avoid lifting anything too heavy that you hurt yourself. You want to rip muscles, not throw your back out and be in pain for a whole week. #7. If your primary goal isn't to bulk up with muscle and your goal is mostly to lose weight then mix your routine with cardio to give yourself a better calorie burn. #8. Stretches! Stretches help keep your muscles limber and you maintain the full range of motion. Practice doing a variety of stretches before and/or after your weightlifting routine. #9. Bodyweight Exercises (see the Frugal Exercise on this website) are a great way to add more challenges to your weightlifting routine without costing you an extra dime. #10. Use your Anger! If you've got pent up emotions like anger in your system use that anger up while weightlifting. It will relieve stress and boost your adrenaline levels, allowing you to endure more than you normally would.